В 1934 году владелец газеты "Daily Mail" виконт Ротермер решил приобрести для личного пользования новый корпоративный самолет. "Daily Mail" к тому времени уже много сделала для развития авиационного дела вообще и деловой авиации в частности. Основными требованиями ДальшеMore>>> Ротермера были высокая скорость, экипаж из двух человек и способность перевозить до шести пассажиров. Вскоре оказалось, что примерно такую конфигурацию имел проработанный в инициативном порядке специалистами компании "Bristol Aeroplane Company" легкий транспортный самолет. 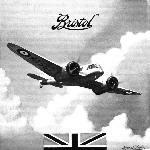 Силовая установка изначально предлагалась в составе двух двигателей Bristol Aquila I мощностью по 500 л.с, но, принимая во внимание требование Ротермера, Фрэнк Барнуэлл решил поставить два Bristol Mercury VIS мощностью по 650 л.с. 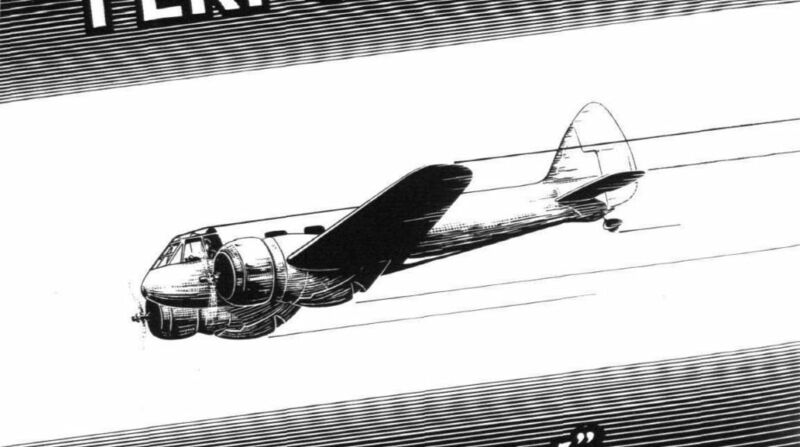 В итоге появился Bristol Type 142, совершивший первый полет в Филтоне 12 апреля 1935 года. Самолет превзошел все ожидания заказчика - он смог развить скорость на 48 км/час больше, чем у прототипа новейшего на тот момент британского истребителя. Самолету присвоили имя "Britain First", и Ротермер торжественно представил его общественности. Буквально тут же Министерство авиации решило взять самолет для испытаний - на предмет возможности его использования в качестве легкого бомбардировщика. Ротермер без колебаний подарил машину военным. Somewhat nebulous, but worthy of incorporation in this section dealing with the larger civil machines, is the Bristol 143. 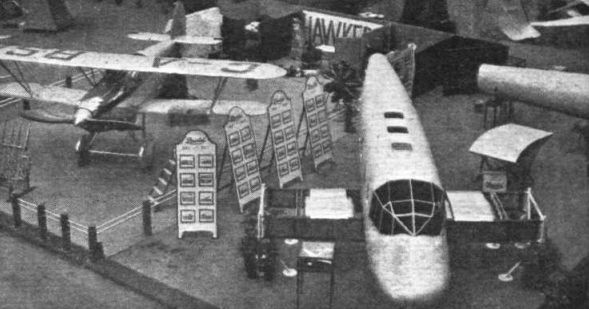 This actually consists of the front half only of the fuselage, and has been erected on the Bristol stand, where it serves primarily to indicate the method of construction of the fuselage and wing roots. 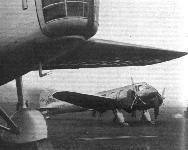 The former is metal monocoque, a system which is further exemplified by other portions of fuselage on the stand. The light alloy sheet is riveted to stringers and formers, making an extremely clean whole. The wing roots show the form of spar construction used - a deep alloy flange with strip steel booms - and also show how the fuel tanks are to be accommodated in them. 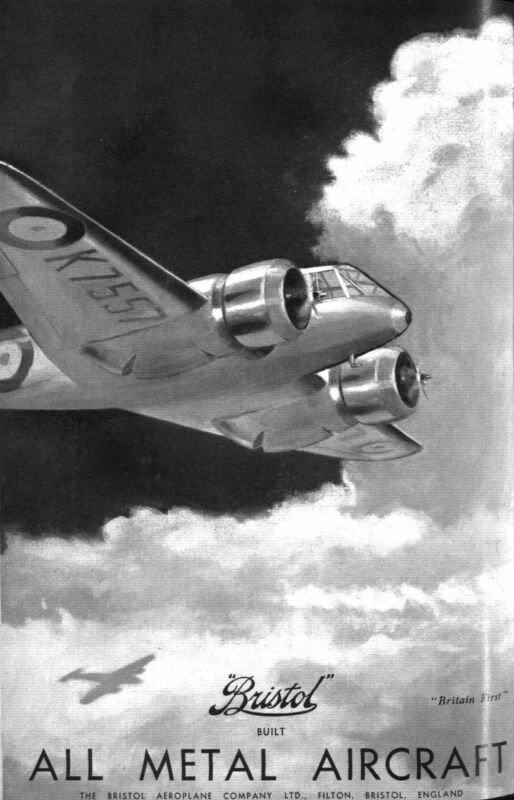 The prototype Bristol 142 (two 605 h.p. 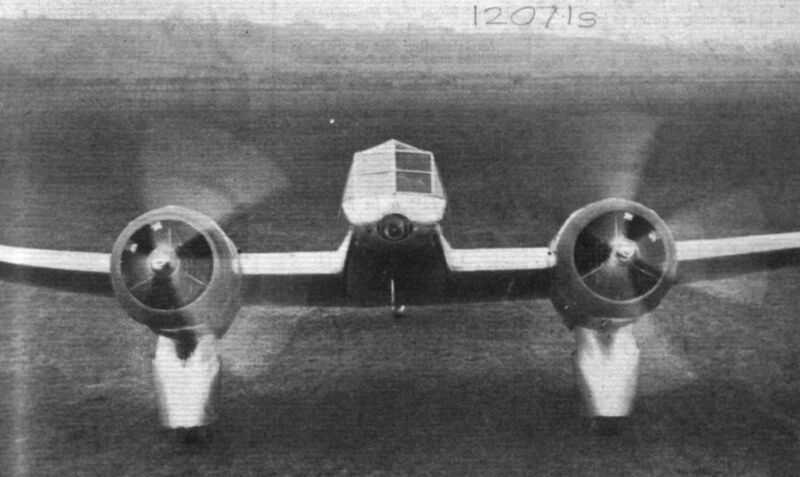 Mercury VI) from which a medium bomber is being developed. 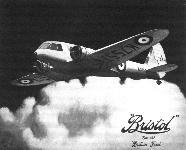 FOR EXPRESS DELIVERY of just retribution and similar loads: The new Bristol 142 (two Bristol Mercury VI S engines), which is credited with a top speed of about 270 m.p.h. 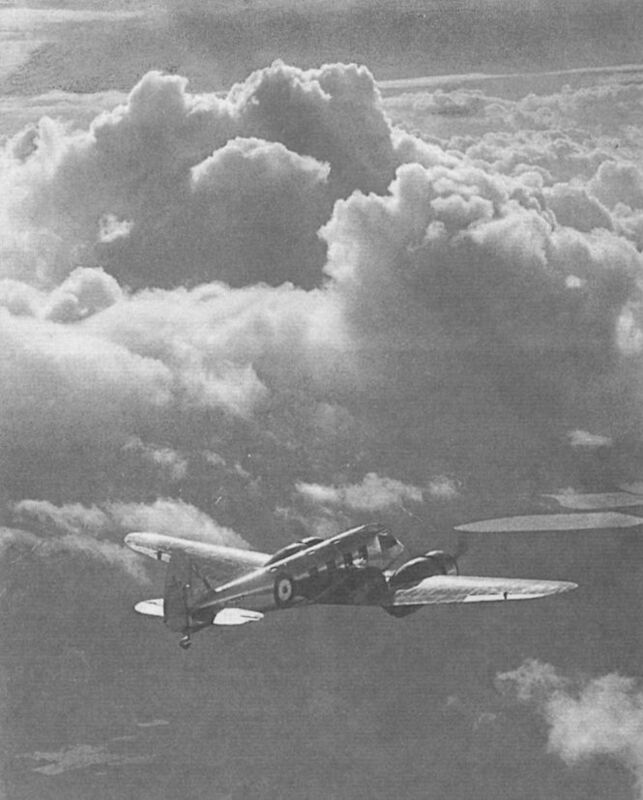 A modified version is being built as a medium bomber for the Royal Air Force Other aerial photographs of this noteworthy machine appeared in Flight last week. COMING EVENTS .... The "shadow" in this case (seen above in the capable hands of Capt. 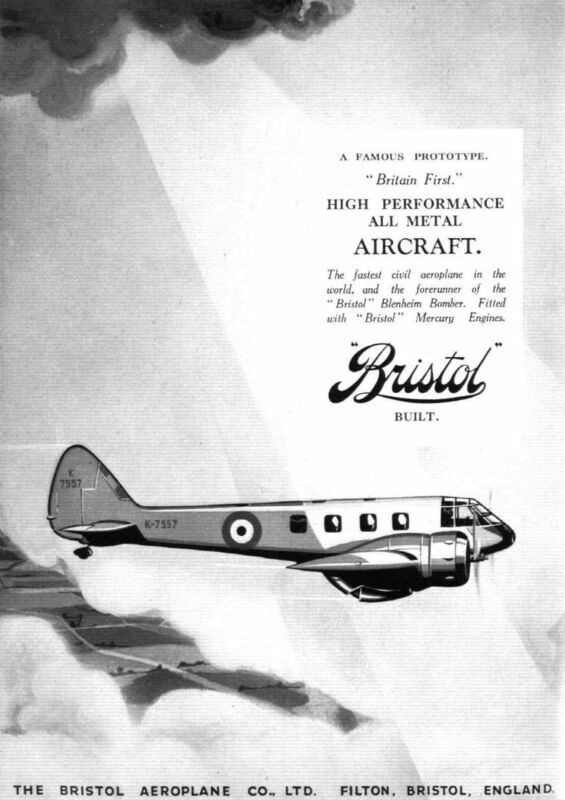 C. F. Uwins) is the Bristol 142 medium bomber (two Bristol Mercury VI S engines). 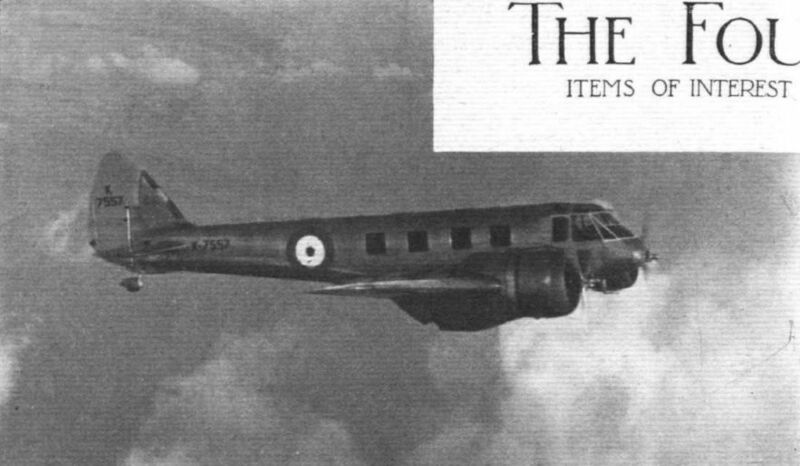 This is the actual machine recently presented to the Air Ministry by Lord Rothermere. A modified version is being built in large numbers for the Royal Air Force. With three-bladed variable-pitch airscrews and a retractable undercarriage this machine has been credited with a top speed of about 270 m.p.h. What the production model will do cannot be stated. 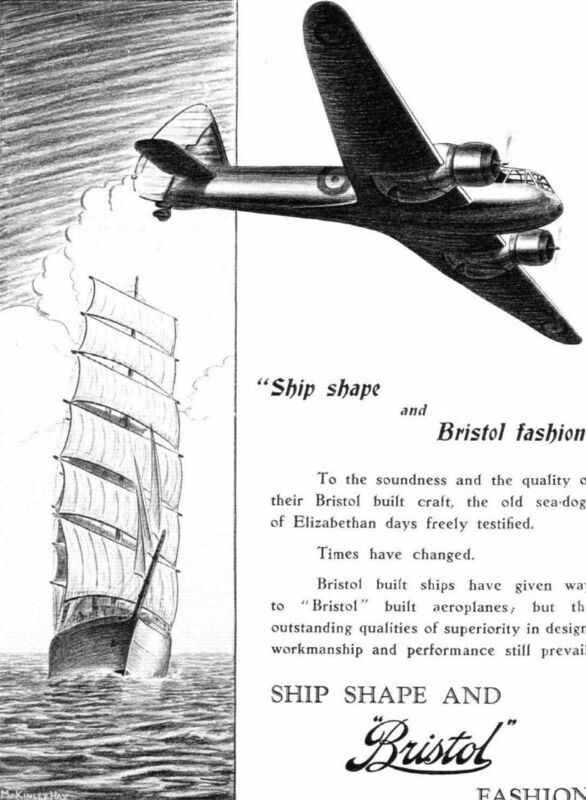 Bristol 142 "Britain First", сфотографированный во время испытаний в Мартлешем-Хит в 1935 году, появился в результате частного заказа медиамагната лорда Ротермера и тут же вызвал интерес у военных. OUTSTANDING 1935 MILITARY TYPE. 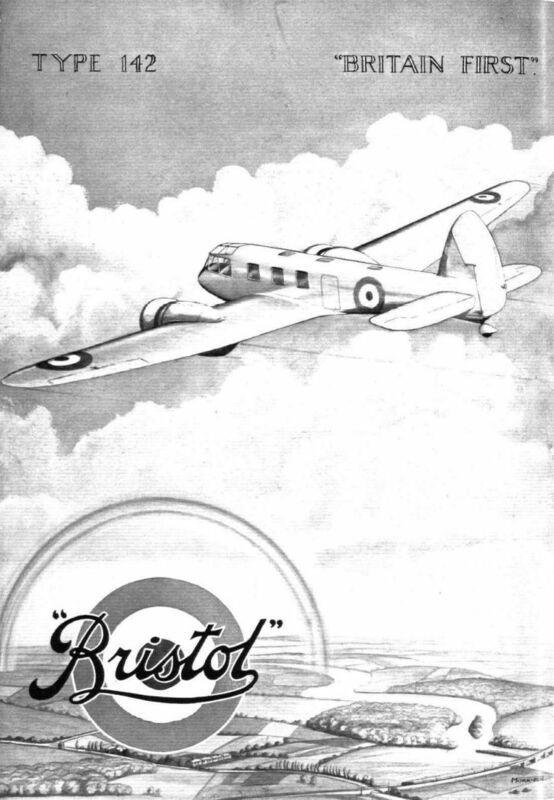 From the Bristol 142 civil monoplane shown a high-speed medium bomber is being developed. In its civil form the 142, with two 605 h.p. 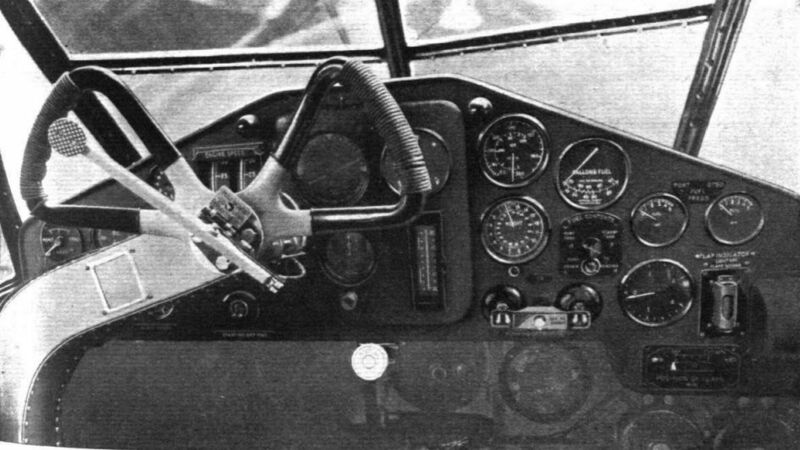 Bristol Mercury VIs, does 268 m.p.h. The sleek Bristol Type 142, named Britain First by Lord Rothermere, was powered by a pair of 650 h.p. 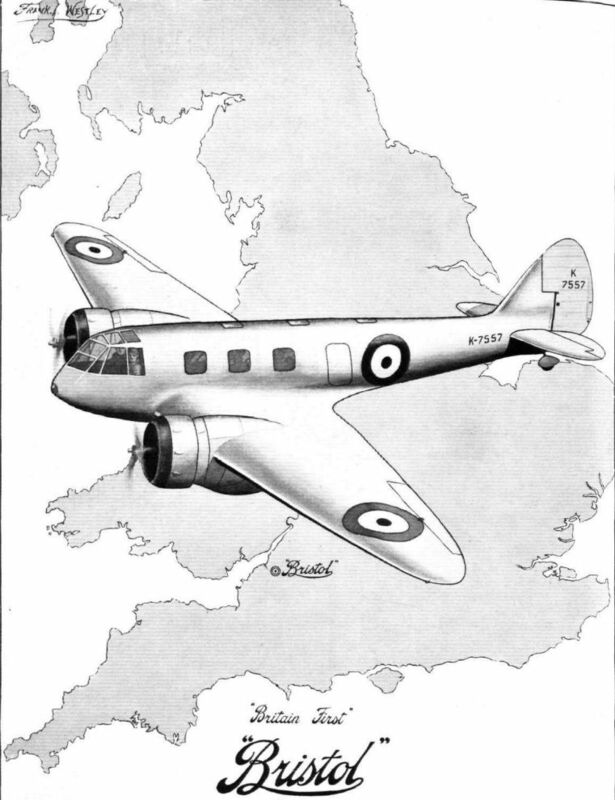 Mercury VIs and made its first flight at Filton on April 12, 1935. 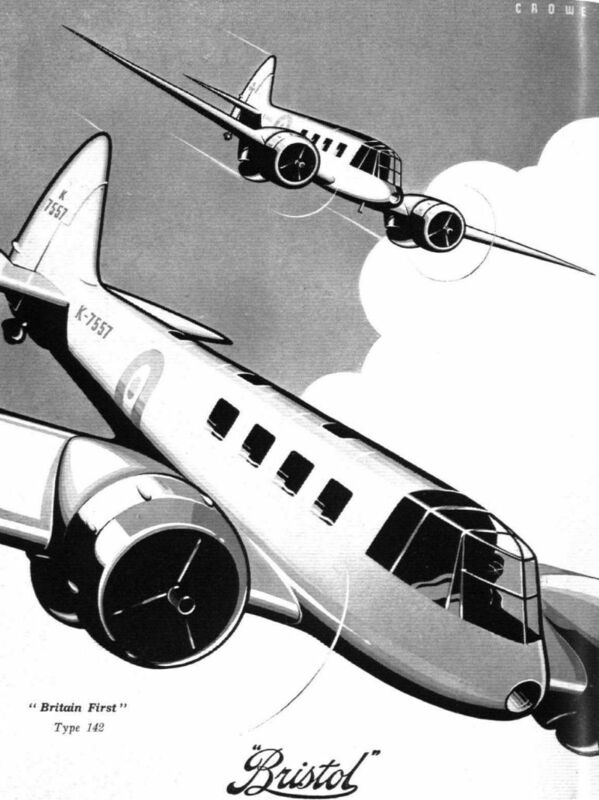 From it came the development of the military Type 142M and the versatile Blenheim. THE FLAPS of the Bristol 142. 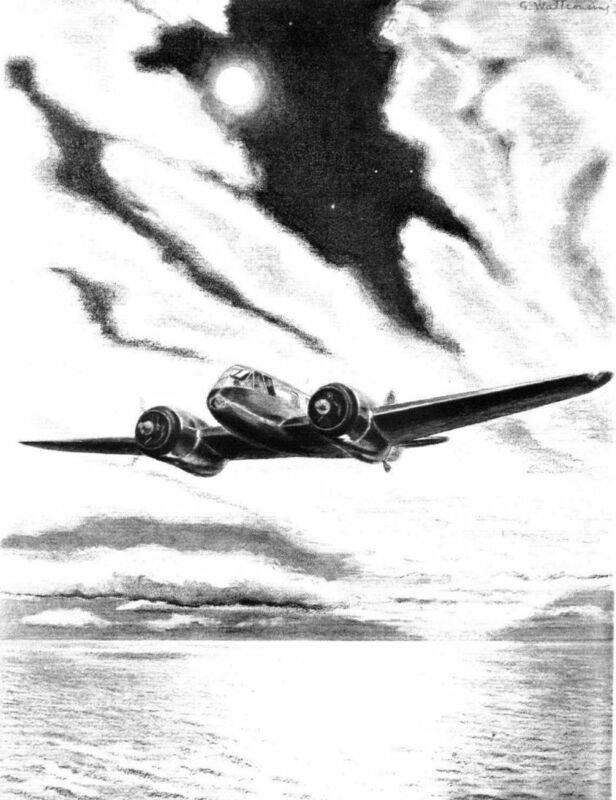 Another noteworthy point in this view is the amount of "visibility" surrounding the pilot. 12 апреля 1935г. : лорд Ротермер заказал самолет Bristol Type 142 в качестве высокоскоростного транспортника. Самолет получил название "Britain First". 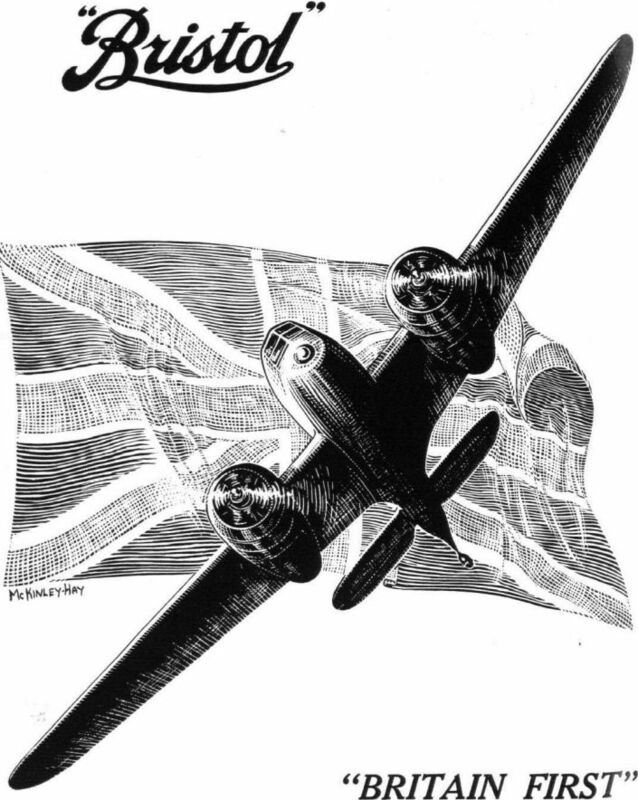 Позже он был построен уже как бомбардировщик Blenheim. MEDIUM BOMBER AND BOMBER TRANSPORT: The Bristol 142 (two Mercury VI S engines), although a fairly large machine, is dwarfed in this view by the Bristol 130 (two Pegasus III M engines) in the foreground. Построенный для "внутрифирменного" использования Bristol 143 с моторами Aquila мог перевозить до восьми пассажиров с экипажем из двух человек. "Конвертируемый" вариант 143F поставили Финляндии как многоцелевой транспортный самолет. 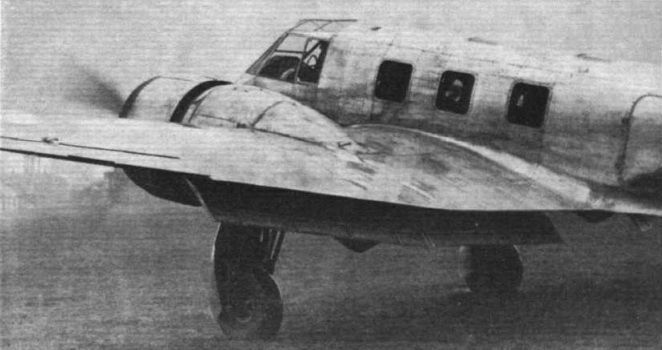 DEVELOPMENT: The first photograph of the Bristol 143 all-metal monoplane, which is the civil development of the now famous 142. 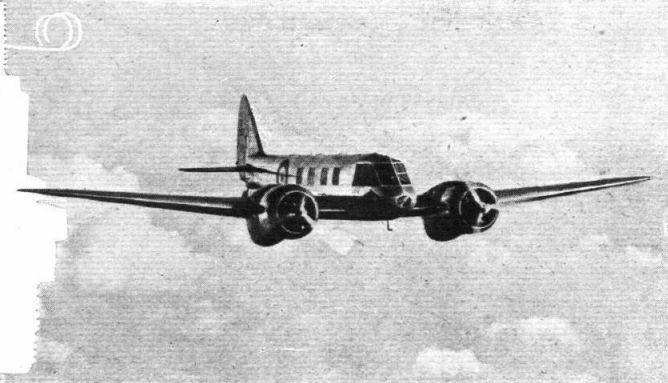 It carries eight passengers and a crew of two and is powered with the Bristol Aquila engines of 500 h.p. each. The undercarriage, of course, is retractable. 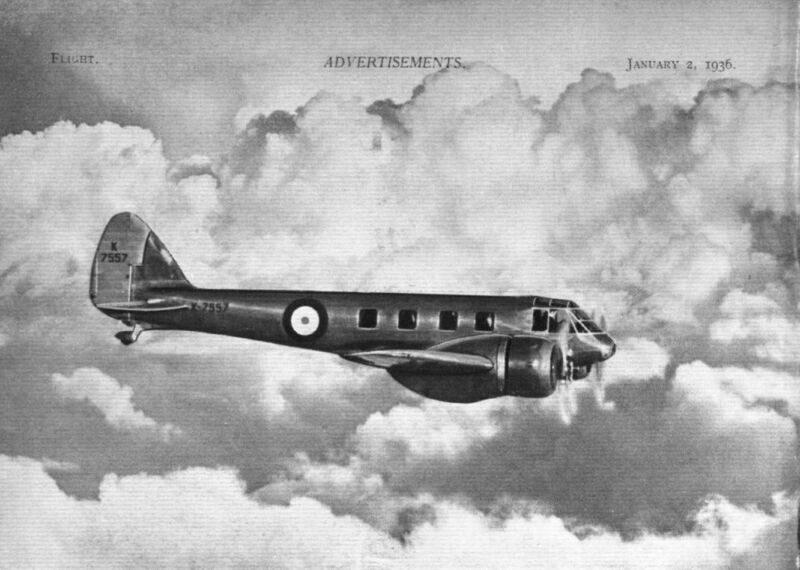 For the moment, this machine must take second place to the Blenheim bomber, which is being manufactured in large numbers. A rough idea of its speed may be gained from the fact that the prototype was popularly credited with a maximum of more than 260 m.p.h.